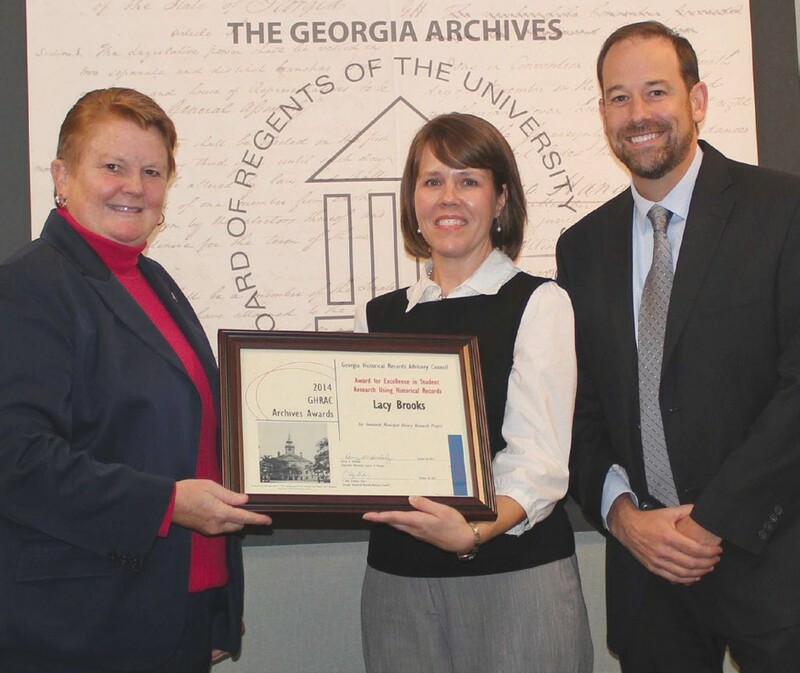 Lacy Brooks receives the Award of Excellence from Georgia Historical Records Advisory Council Chairman Dr. Toby Graham and Dr. Linda Noble, Vice-Chancellor for Academic Affairs for the University System of Georgia. A City of Savannah research project documenting the municipal use of enslaved people prior to the Civil War won top honors for archival work by the Georgia Historical Records Advisory Council last week. Lacy E. Brooks won the Governor-appointed Advisory Council’s Award for Excellence in Student Research Using Historical Records – Graduate Level for the “Savannah Municipal Slavery Research Project.” Ms. Brooks completed her graduate internship with the City’s Research Library & Municipal Archives this past spring prior to graduating with a Master of Arts degree in Public History from Armstrong State University. Her internship included identifying, analyzing and digitizing archival records that document the City’s use of enslaved people to support municipal work prior to the Civil War. The honor came during the Oct. 30 Georgia Historical Records Adviso- ry Council annual awards program at the Georgia Archives in Morrow. Ms. Brooks’ work included a detailed paper providing her research methodology, as well as an online presentation that features historical records, images and documentation on the individuals the City bought and sold during slavery. These enslaved people, most supporting public works departments, have been a forgotten segment of the City’s workforce and Ms. Brooks’ work is an important contribution to the study of the City of Savannah’s history. The public can access the project report and online presentation through www.savannahga.gov/slavery.